This book presents a unique, in-depth examination of the effects that the popular approaches to management organizational change―downsizing, restructuring, and reengineering―had on a major American hospital. The Human Cost of a Management Failure shows what can happen when management insists on accomplishing its ends strictly by the numbers. The authors ask why top management so often, and with seemingly such a cavalier attitude, selects downsizing and similar methods when research indicates that they are all too often such poor choices. Based on a year-long longitudinal study, Allcorn, Baum, Diamond, and Stein report on their interviews with 23 senior and mid-level hospital administrators, then interpret their findings from a psychoanalytic perspective, to make clear that the human side of the workplace can only be ignored at great risk when change is contemplated and then implemented. This is essential reading not only for corporate management, but also for other professionals and academics throughout the social and behavioral sciences. Readers of The Human Cost of a Management Failure are oriented to the literature on downsizing, restructuring and reengineering, and to the context of the study. Case material follows, enabling readers to draw their own conclusions with regard to the nature of the organizational change and its effects upon the hospital's employees, and consultants offer their own viewpoints. An update of events at the hospital after the study was conducted is provided along with summaries by each author of his own interpretation and how he interprets the others' views. In this way, readers will get an unusual opportunity to evaluate their own viewpoints against those of the psychoanalytically trained researchers, and to decide for themselves whether there are, in fact, better ways to make an organization economically competitive in the marketplace. Three psychoanalytically trained researchers report on the devastating effects that downsizing had on a major American hospital and its people, and call for other, better ways to accomplish the same economic ends. SETH ALLCORN is a principal of DyAD, a consulting company that supports change in organizations. He has worked twenty years as an academic health-science-center executive and is a member of the Medical Group Management Association and the International Society for the Psychoanalytic Study of Organizations. He is the author of six books, three chapters, and more than 50 papers. HOWELL S. BAUM is a Professor of Urban Studies and Planning at the University of Maryland. He is the author of three books, nine chapters, and more than 40 papers. He is a member of the International Society for the Psychoanalytic Study of Organzations. MICHAEL A. DIAMOND is a Professor in the Department of Public Administration, University of Missouri-Columbia. He is the author of one book, two chapters, and more than 25 papers. He was awarded the American Psychological Association 1994 Harry Levinson Award for Excellence in Counsulting Psychology. He is a principal of DyAd, a consulting company that supports change in organizations. He is a member of the International Society for the Psychoanalytic Study of Organizations as well as a number of other associations. HOWARD F. STEIN is a Professor in the Department of Family Medicine at the University of Oklahoma Health Sciences Center. He is the author of 16 books, 31 chapters, and more than 160 papers. He also frequently publishes poetry. He is a member of the International Society for the Psychoanalytic Study of Organizations as well as a number of other associations and societies. 1. 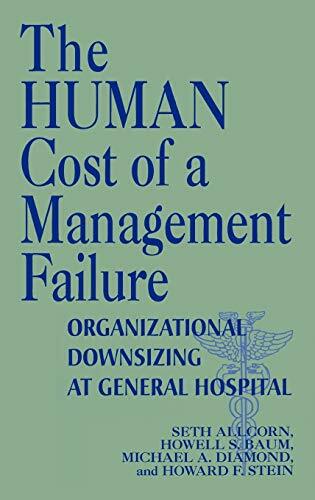 The Human Cost of a Management Failure: Organizational Downsizing at General Hospital [Hardcover] Allcorn, Seth; Baum, Howell S.; Diamond, Michael A. and Stein, Howard F.